How Did My Tyre Go Flat? At Cheap AZ Towing, we understand that getting a flat tyre has to be one of the most frustrating things that can happen. What’s even worse than the flat tyre, is not knowing how it happened. One of the most common causes of a flat tyre is a puncture. 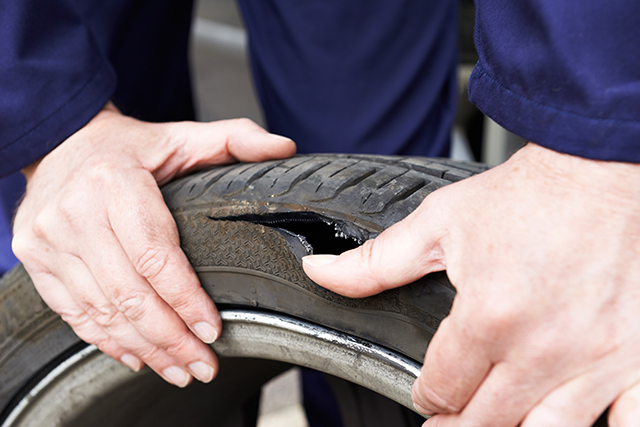 Sharp objects can often find their way onto roads and wedge themselves into your tyres. If the puncture is only small it may take time for the tyre to deflate, or it can deflate almost instantly. Wear and tear can also cause a tyre to deflate. If your tyres are left without much tread or they haven’t been replaced in a while, they can start to crack or holes can appear. A harder to detect reason could be a broken tyre valve. If it’s broken or damaged air can seep out of the tyre slowly, making it harder for you to realise. The best way to figure out why your tyre has gone flat, is to take it to a tyre shop. They can usually fix the issue for you, and save you the cost of buying a new tyre. If you have a flat tyre, you should replace it before you start driving again. When you drive on a flat tyre you can damage the shape of the hub, or the shape of your wheel if they are alloy wheels. It can also be harder to control a car with a flat tyre, which means you’re not only putting yourself in danger, but also those on the road with you. If a Flat Tyre Has Stopped You in Your Tracks, call Cheap AZ Towing on the Gold Coast! If you’ve got a flat tyre, and you don’t have a spare, or for whatever reason, you can’t change your tyre, and need a towing service we’re here to help! We have 24/7 roadside assistance.